We all know that there are lots of factors that should be considered in purchasing a brand new air conditioning unit. One of the most crucial variables is the size. Without proper knowledge, many homeowners were able to purchase the wrong unit which gives them poor comfort, poor savings or worst, both. Whatever type of air conditioning system that you’ll take, there are always a variety of sizes to choose from and getting the right size can make a great difference. Will You Save More on Small Air Conditioning Units? Not exactly. When your air conditioning unit is too small for your home, it will not be able to reach the temperature set on your thermostat. It has to run round-the-clock to reach your desired temperature, but even so, there will still be hot and cold areas in your home. As a result, you will have poor indoor comfort in summer and a strikingly high energy bill. What Happens When Your A/C Is Too Big For Your Home? It is a common idea of many homeowners that buying a big air conditioner will give them greater comfort and more savings. The truth is, it is exactly the opposite that happens. The too big air conditioner can cool the space fast, resulting in a continuous on and off cycle. This can put a lot of strain on your system and lead to the early breakdown of the components. A too big A/C can lead you straight to expensive repairs and maintenance services. Additionally, your air conditioner does not just cool your home; it is also responsible for keeping the right humidity level inside. If the cooling cycle is too short, your unit will not be able to remove enough humidity to keep your home comfortable. This will give you a damp and clammy indoor atmosphere. Honestly, finding the right size for your unit is a challenge especially if you do not have enough knowledge about this matter. Some factors to be considered include the square footage of the space you want to cool, your home’s insulation, and the climate. For this task, you will need the assistance of a professional expert who can give you the complete information about the size of A/C that will surely fit your place. 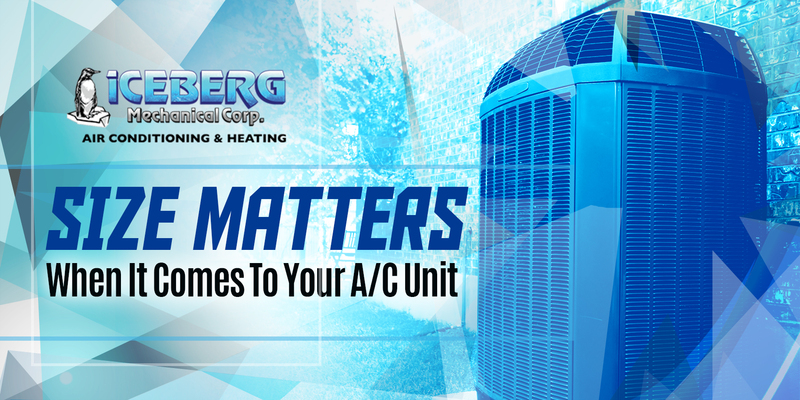 Iceberg Mechanical can give you an accurate measurement to help you find the right cooling system for your home. Give us a call today!